After last Friday’s game day at Chicago Indoor Sports, Tory Burch may be feeling ready to create a line of soccer cleats! 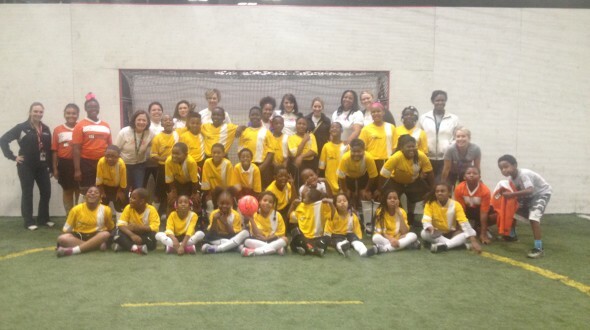 Well, that may not be entirely true, but our players from Providence Englewood Charter School (PECS), Pasteur Elementary, and Marquette School of Excellence had an awesome time playing soccer with ten Tory Burch volunteers! When the players from PECS, Pasteur, and Marquette arrived at the Indoor Center, they jumped on the field with their new coaches and immediately started playing soccer. All three teams have huge rosters, so there were brightly colored jerseys as far as the eye could see as the players passed, defended, and celebrated all over two huge fields. While the kids ran back and forth from end line to end line, the volunteers paid close attention from the sidelines, cheering for well-placed shots on goal and encouraging players to help each other up when legs got tangled. A huge Urban Initiatives thank you goes out to Team Tory Burch for sponsoring the event and for taking the field with our players for the afternoon, and a special shout out to Daisy Hu for helping make the game day possible!